I decided to address this topic today while looking at an “infographic” about the costs of the war in Iraq shown below, which was created by Good Magazine, based on the book Three Trillion Dollar War: The True Cost of the Iraq Conflict by Nobel Prize laureate Joseph E. Stiglitz and Linda J. Bilmes. Moderately sized, meaningful combinations of words, images, and shapes that together constitute a complete communication unit. Visual and verbal elements are tightly integrated. Is as self-contained as possible on 1 or 2 pages or on a large screen. Usually contains more information than a concept diagram, although an information graphic may use any of the types of concept diagrams as its central visual element. Usually contains several blocks of text. This form and use of visualization has become popular in the last few years. We now see frequent examples of infographics in major news publications. I’ve seen examples that work to communicate effectively, but more that, in my opinion, do not. What accounts for these differences in the effectiveness of infographics? 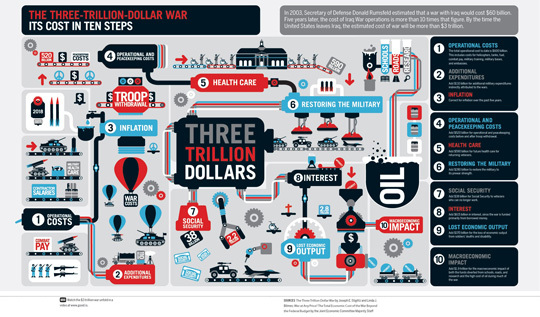 I believe that the Three Trillion Dollar War visualization, which tells a story that I care about and consider important, fails as an infographic. Aspects of its visual design discourage me from examining it. It’s hard to look at. Even if the aesthetics were more pleasing to the eye, I don’t think the graphics achieve their communication objectives. The story is adequately told by the text-the ten points that are described verbally to the right of the graphics. The graphics add no value or meaning that isn’t contained in the text. The pictures themselves don’t reveal anything we can’t learn more clearly from the text. Graphics should only be used when they communicate more effectively than words or words alone. Visual displays can do a great job of revealing relationships that might be difficult to communicate with words alone, but the relationships between the various costs that appear in this infographic are buried in visual clutter. GOOD is a collaboration of individuals, businesses, and nonprofits pushing the world forward. Since 2006 we’ve been making a magazine, videos, and events for people who give a damn. This website is an ongoing exploration of what GOOD is and what it can be. Based on what I’ve read, I like these guys and support what they’re trying to do. I want their work to succeed , but as an information visualization professional, I’m concerned that in this case at least their good intentions have been undermined by ineffective graphics. Why are we still producing chartjunk? Jacques Bertin put us on the road to effective uses of visualization by introducing the basic vocabulary of visual communication. Tufte refined and extended this work, especially in regards to quantitative communication. Robert Horn synthesized much of what’s being done and demonstrated the existence of visual language. But today, rather than continuing in this critical scientific tradition, infographics reminds me of Web design in the early days: free expression with little regard for practices that have been proven to produce the desired outcomes. No one seems to be doing any work to determine what works and what doesn’t, and to understand why. Or, if they are, I’m not aware of it, and am rarely seeing the results. I share Horn’s vision, but I’m not sure that during the last 10 years since he wrote these words, the hope and enthusiasm that he expressed in the final sentence applies to infographics. Just as statistical graphics have been subjected to empirical study, and continue to be, resulting in guiding principles that can be found in the works of Tufte, Cleveland, and more recently my own, infographics must do the same if we wish to apply them effectively. I’m interested in your thoughts, especially if you’re an infographics practitioner. Are you aware of work that’s being done to put infographics on the track to effectiveness that it needs to mature and definitely deserves? I’ve been thinking a lot lately on visual thinking and visual representations of abstract data and concepts. I recently read a book by Eric K. Meyer entitled “Designing Infographics” and thought it had valuable insight on how to create effective infographics as well as provided strong examples throughout. Seeing the examples with his commentary has helped me in my own work of creating actionable, insightful visual data representations. There are much better examples out there. Regarding “Designing Infographics”, it’s unfortunate that the book is so expensive (almost $200 new, according to Amazon). Given the fact that it was published in 1997, it might provide useful recommendations, but I doubt that they’re derived from empirical evidence. When Robert Horn wrote “Visual Language” two years later in 1999, little if any research into effective infographics design practices appeared to exist. If Meyer mentioned pertinent studies in his book, I’d appreciate it if you would let me know. The book “Data Flow: Visualizing Information in Graphic Design”, was published this year, but it appears to cover a broad range of diagrams, graphs, etc., and it isn’t clear that it’s recommendations are based on any empirical research. Tim–have you read this? If so, I’d be interested in hearing what you think of it and it’s merit as a repository of tested and proven design practices. No, haven’t read it yet, only snippets and previews around the web. Thanks Tim. I’ve ordered both books. Keep your eyes open for future book reviews. I agree. I picked up the GOOD fliers at my local Starbucks. I had hoped to use them in my business research methods class as examples of good infographics and data visualization. But sadly I found them pretty spotty and infused with a bit too much Chartjunk. I wonder if the problem arises from the fact that infographics are trapped between science and art. Art being more subjective allows to creator to be less self critical in their evaluation of their work. That and what Jorge Camoes has referred to as loss aversion. Some times you just can’t pull off the level of data density you might prefer given the quantity of data you have? I think your observation that infographics reside in a murky place between science and art is accurate and a big part of the problem. Somehow we need to merge the two in a way that combines what’s relevant and useful from both–in this case, what’s relevant and useful to communication. I’ve seen infographics that suffer due to the loss aversion, which Camoes refers to, but I don’t think the failures of this particular example were caused by this. The graphics and their arrangement just don’t seem to work. Let’s think about this particular case for a moment. We want to tell the story of costs associated with the war in Iraq; how they will vastly exceed Rumsfeld’s estimate, along with a look at the various expenses that make up the whole. Given this task, how could we tell this story visually in a way that supports these specific intentions and in a way that words alone could not? How about using either a simple bar graph or a waterfall chart, with bars for each category of expenditure that makes up the whole. We could also include a reference line to show the original $60 billion estimate compared to the $3 trillion whole. This isn’t an infographic–it’s a simple quantitative graph. Not every story should be told with an infographic. Practitioners should know when infographics are appropriate, when other visualizations are appropriate, and when words alone do the job. Their work can be ordered via http://www.christoph-merian-verlag.ch/index.cfm?init=1&language=EN. These two art students have developed some very innovative visualizations of data that they have gathered during their diploma work. They are presented in unique book, with poster sized graphics. Their visualizations are aesthetically fascinating while remaining very readable, in contrast to Stephen’s example. My copies of the two books that you recommended have arrived. “The Information Design Handbook” looks quite promising, based on a cursory review. I’ll write more about it after spending more time with it. The other book, “Data Flow: Visualizing Information in Graphic Design,” in contrast, misses the mark. The design of the book itself is a disaster, which is inexcusable, especially for a book about information design. Despite nice words in the foreword about how information graphics succeed or fail based on their ability to communicate, this book exhibits little evidence for this concern. While some of the examples are nicely designed, this book makes no distinction between good and bad designs, and it doesn’t display the good examples well enough for them to be properly appreciated. In many cases it’s hard to tell if the designs work, because the images are too small for legibility. Most are incomprehensible. None have been critiqued for their effectiveness or explained well enough for readers to make informed judgments about their merits. This is a great, fundamental topic. We do have the knowledge, but it isn’t being taught and applied effectively yet. I addressed this very issue in my master’s thesis: how to create effective, useful, qualitative diagrams, based on fundamentals of human perception and cognition. My approach was not to merely give hints and suggestions (don’t use pie graphs, get rid of chart junk, etc. ), but instead to actually teach enough about fundamentals of visual perception*, and then apply that learning within a design process. Beyond that, I applied a user-centered approach to the diagram design philosophy and process, asking the would-be diagram designers to actually consider their own goals, and the specific needs of their audience; something Good Magazine clearly failed to do. In any case, I feel like this arena is being investigated, little by little. Your books and blog help, as to other good sources of interesting and quality information graphics (The New York Times, Many Eyes, etc. ), and I do feel like quality is being recognized and valued, if slowly. * Chapter four of Information Dashboard Design is a fantastic primer on perception; I’ve recommended it several times. I find it more concise and quickly accessible than Ware. Thanks so much for joining the discussion. I’ve only had a chance to briefly skim through your thesis so far, but can already tell that you exhibit the focus on effective design that infographics desperately need and too often lack. I’m looking forward to an opportunity to read it more closely. I wish you well in your work. Thanks. That was an interesting read. I think your design process can be put to good use in instructing students to create effective visualisations. Also, in my opinion your approach can be used to great advantage not only with complex diagrams, but with simple diagrams as well. All too easily it happens that one skips over the crucial first two steps: “What do you want to tell?” and “What about the people you will tell it to?”. Getting in the habit of applying the process you’ve described in your thesis would be a good way to prevent paying too little attention to those two steps. Here some, personal, thoughts on this interesting topic. I’d like to start form the assertion made by taggert and confirmed by you, Steve; Infografics is a combination of science and art at the same time. The topic is challenging but we have all the ingredients to make it relevant to communication. The ingredients I’m talking about comes from the past, starting from the prehistoric age up today. The first human kinds left us a sign of their presence by drawing on the wall of the caves scenes of hunts and daily activities. What concerns us is the irrefutable clarity of those signs. The evolution of communication has led humanity to find a more articulated but more convenient way to express it: writing. There is another element, or ingredient, I believe we have to take into consideration; painting, with particular attention to the fresco technique. The fresco technique was used to decorate big portion of walls in churches, cathedral and palaces. One of the most fascinating aspects of a fresco is the ability to represent, on a wide wall, a wide variety of details that have a precise meaning when taken individually, and also have a clear role in the whole context. Then the observer, at variable distance, will always have access to different information, from the Big picture to the detail, like a drill down action. Unfortunately an infografic cannot be deployed on a wall, or at least this is not a conventional way. Last ingredient, in my opinion, is coming from photography. One of the key rules, while compose a picture is to identify and isolate clearly the main subjec . There are different techniques to do that; by using colors, shapes, patterns and more. To reach the point to combine in an effective way the science and the art to transmit the message, I think it is necessary to keep in consideration some the lessons learned from the past, by using graphic universally recognized (http://it.wikipedia.org/wiki/File:Voyager_Golden_Record.jpg) , always have a subject well defined, and from fresco’s, even if we do not have a wide surface, to link the detailed information in the simplest way possible to the main message. Finally, art can help in providing emotional elements that can amplify the message in the communication. I’d really like to see a contrast. The Good graphic is very information light and the art adds nothing to the information. I once saw a designer do a usability tear down of the Jacob Nielson usability website and redesign it to be vastly more useful. It would be great to see your teardown come with specific improvements we could learn from, building them into a coherent whole. It’s good to watch how smart people build great things.